Preservation - Write a letter today to save a historic WAHA property from demolition! We need your help to help save a historic property AND a historic neighborhood! 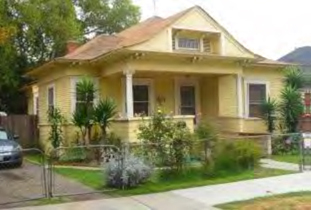 West Adams is on the verge of losing another historic house and a bungalow at 1828 South Gramercy Place in the Angelus Vista National Register eligible district. If we don’t act quickly, we will lose them, because a brand new owner has already applied for a demolition permit. WAHA is working hard behind the scenes with City staff, but it has become clear that we need letters sent to Council President Herb Wesson, and his staff, asking the CD10 Council Office to step in. Sometimes glorious historic jewels are wrapped in plain paper. Such is (was) the case with the former St. James Armenian Apostolic Church’s Sanctuary, located at 3200 West Adams Boulevard. Built in 1957, the unadorned and blocky modern exterior of the church – designed to evoke in its shapes centuries-old cathedrals in Armenia – hides from clear view what was a splendid historical interior space. The St. James Sanctuary featured extensive murals on the walls and dome, gold leaf enhancements, copper niches, wood trim, wainscoting, and a mezzanine loft. Highways or Communities: What is Our Future? I-110 HOV Flyover hearing is scheduled for Tuesday, February 23, 6-8 p.m.
“We build highways.” And apparently at the expense of communities. 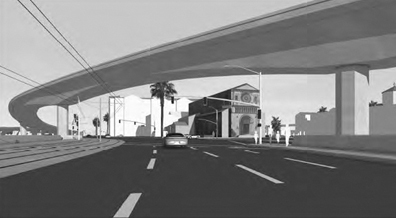 That’s what a Caltrans staffer told us when we questioned why the agency was even considering erecting a massive 54-foot-tall concrete structure (the I-110 HOV Flyover) that will tower over West Adams Boulevard landmarks like St. John’s and St. Vincent’s Cathedrals, and split yet another community in half. 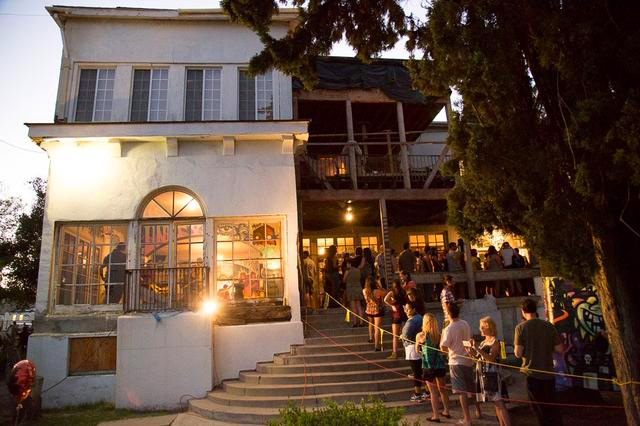 WAHA is in the community-building business, and of course the historic preservation business, and that’s why we urge everyone to attend the hearing on Tuesday, February 23 (6-8 p.m.), at the Orthopedic Institute for Children, 403 West Adams Blvd. This is your chance to stand with stakeholders, Councilmember Curren Price, and Senator Feinstein’s field staff and give voice to your concerns. 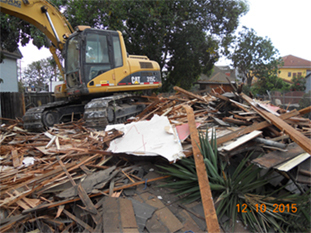 Above is the historic Victorian cottage that was demolished when the owners found out their permit was invalid and being revoked. For all of the WAHA members who thought we would cheerily enjoy this holiday season without a lump of coal in our stockings, our season’s cheer has been interrupted by a senseless and fraudulent demolition. It’s not every day you see a house heading down the street, but that happened twice in July just north of USC’s University Park Campus. The rare double house move will help preserve a pair of turn-of-the-century homes in University Park. 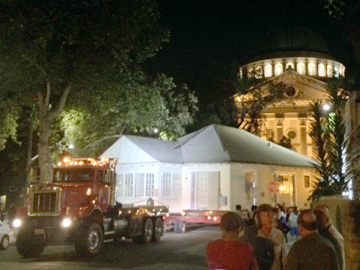 In the wee hours starting at midnight on Wednesday, July 22, and Thursday, July 23, the university relocated two historic buildings from Royal Street to a vacant lot on Portland Street. 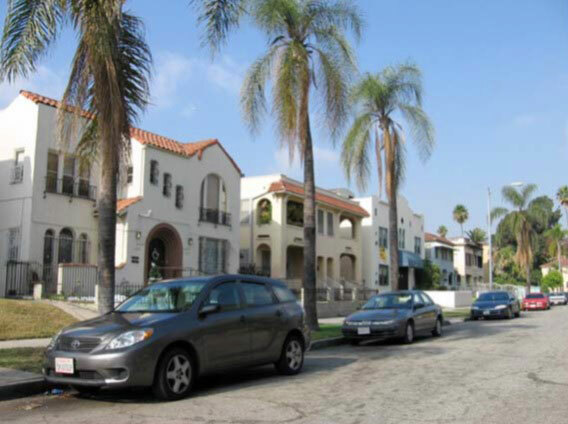 The project is a collaboration between USC, the University Park Historic Preservation Overlay Zone, WAHA, and Southland Development, a for-profit organization that works to provide quality community housing.